Taipei – May 08, 2018 – Innodisk, a leading manufacturer of storage, memory, and expansion solutions for the industrial and embedded market, is offering innovative approaches to aerospace and defense, and heavy computational load applications. The 1.8” SSD has a good track record in the industry, but it is ready for a make-over to fit modern mission-critical requirements. 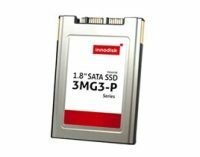 With solid 2D NAND SLC and MLC products already on the market, Innodisk is currently developing a new 3D NAND drive that delivers industrial-grade performance and high capacities. Coupled with advanced LDPC error correction and RAID functions, this new series offers comprehensive data safety measures. And, for anyone worried about data falling into the wrong hands, AES hardware-based encryption is easily added and offers an unbreakable barrier against data leakage. Mission-critical applications are moving out into increasingly remote areas. These places often struggle with power supply stability, which in turn can affect storage devices. To meet this challenge, the 1.8” SSD series is available with power stability features such as iData Guard™ and iCell™, for devices both with and without DRAM buffer. The series offers sequential read /write speeds up to 520/450MB/s based on MLC flash, with capacity up to 1TB. iSLC technology that drastically increases product lifespan is also available. This technology is suitable for applications where longevity is crucial. Vorherige Pressemitteilung Technologie-Pionier UMIDIGI Z2|Z2 Pro Flaggschiff Smartphone angekündigt!